Hello again, twice in one week, that’s pretty good. I’m really looking forward to sharing my projects with you again. The new Stampin’ Up catalog is being released so soon and I have tons of projects to make. I have seen the new stuff and all I can say is “WOW”, they did a good job this year! I can’t say anything else, you’ll just have to see for yourself on July 1st. I have another stamp club project to share with you today. 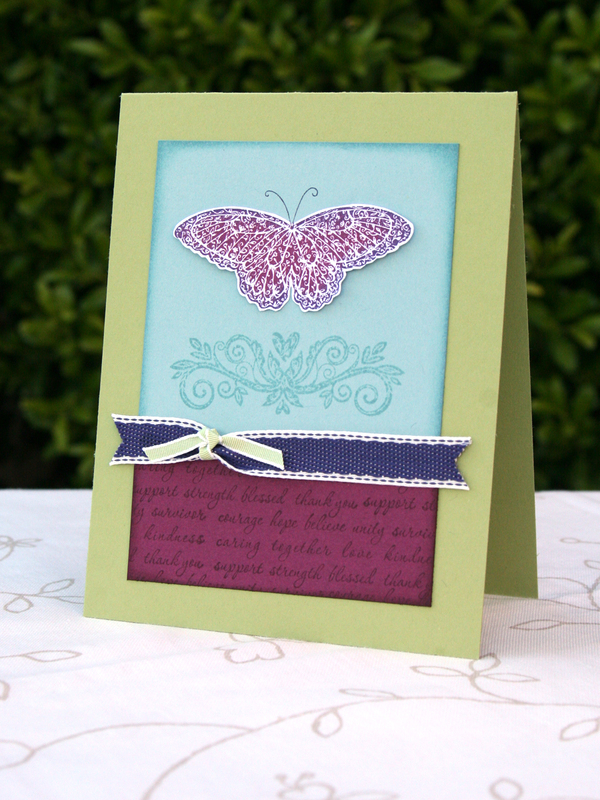 This card uses the Strength & Hope stamp set form the Summer Mini. With each stamp set sold, Stampin’ Up donates $2 to The Breast Cancer Research Foundation. It’s such a great cause and a beautiful set. I used a sponging technique on the butterfly to give it more dimension and a prettier color. First ink your butterfly image with Rich Razzleberry, then use a sponge dauber to apply Crushed Concord ink (in a daubing motion) onto the edges of the butterfly. When complete, huff on the image and stamp onto whisper white paper. Instead of cutting around the antennas, I stamped them on the Baja Breeze before adhering the butterfly. ← UStamp with Dawn and Friends Blog Hop Coming Soon! I love this card! (and I just love your style:) Congrats on the exciting news! I have 2 children and my daughter was our first. Enjoy every moment! My daughter just finished kindgarten….time FLIES!! Love this card…the colors…the design. It has such beauty in its simplicity!